Kirk Douglas (Howard Nightingale) and Bruce Dern (Jack Strawhorn) star in this off-beat Western from the cynical seventies. Outshining both of them is Virginia & Truckee 4-4-0 #11 (The Reno), built by Baldwin in 1872, and leading its little train of one boxcar and coach. The movie itself contains a lot of political twaddle (Douglas is a sheriff running for governor), but the railroad scenes are outstanding with horse chases, gunplay, explosions, fireballs and leaping on and off a train moving in REVERSE! 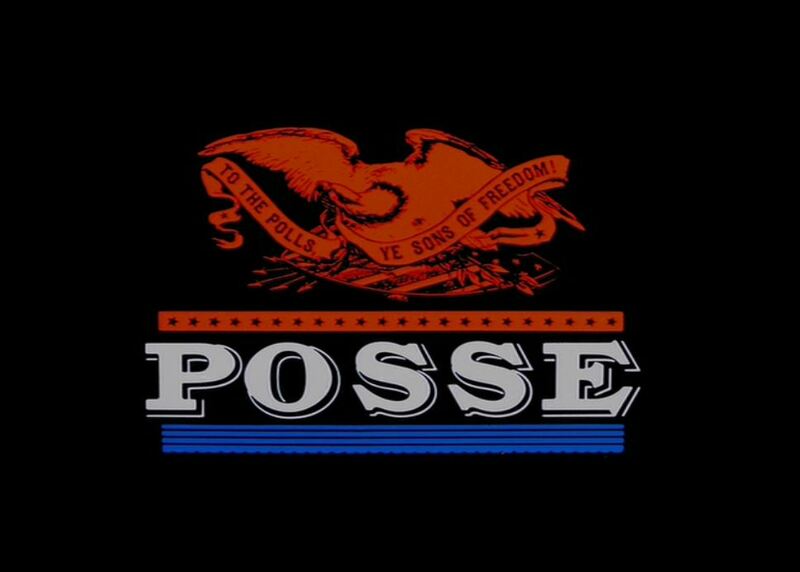 Filmed in the Old Tucson western town (pre-1995 fire) and on Southern Pacific’s Hayden branch in Arizona, Posse will satisfy all your train action needs. Saddle up! A posse is in pursuit of the Reno as it churns along in the hands of that evil villain, Strawhorn. Are those flames shooting out of the boxcar? Explosions coming up, oh boy!! Our story opens with the posse train rolling thru the desert sage with the engineer and fireman putting #11 through her paces. As the train approaches the little town of Tesota, Texas (elevation 1,352 feet), the townsfolk come out to greet them. Hi Mister Engineer! ; Lowering the drawbridge of the custom-built horsey boxcar. The steel boxcar is built like a Sherman Tank. Notice how it towers above both locomotive and coach. If you watch closely during later scenes, you can see it is reinforced with big steel beams inside. It must have been a custom-built job just for this movie. Unloading Sheriff Kirk’s favorite white steed; bringing his horse around to the back of the observation car — to make a proper entrance; A good view of the “Silver Star” of the Texas & Arizona Railroad (the T and A, ha ha ha…). What’s interesting are those curious reporting marks on the front of the car. I’m guessing C.C. 23 T.A. translates to Chair Car #23, Texas & Arizona? As Sheriff Nightingale canters through the crowd, it comes out that he and his posse have killed or jailed Strawhorn’s entire gang, BUT… Jack himself is still on the loose. In fact there’s a whopping $500.00 price on his head. Much politicking and boring plot left off HERE. Finally, Nightingale captures the bandit Jack and the townsfolk give Howard a big sendoff as he totes Strawhorn off to prison. As the fireman puts another log on the fire, The Reno steams blissfully along as Sheriff Howard regales the none-too-enthused boys about his future exploits as governor. Ahhhh….Smugly, Kirk sits down for three fingers of whiskey…but all is not well. Is that the boxcar door opening? Bruce Dern’s stunt double and horse take a spectacular somersault off the speeding train. He’s getting away! After him, boys! What’s this, what’s this?? The smirking Strawhorn is running the locomotive backwards! ; the outwitted posse gives chase, but is unable to catch the fast-moving steamer. But Sheriff Howard doesn’t give up so easily. His stunt double makes a stupendous leap onto the locomotive. Climbing into the cab, the bandit Jack seems to be missing. ; D’oh!!! Jack gets the drop on Howard from the cab roof. Now a prisoner himself, Nightingale can only look sheepish as Engineer Bruce Dern shows off his enormous teeth. The fire started by Strawhorn (to make his escape) is getting out of control. There are crates of ammunition back there! It’s not dynamite, but it will do…. Meanwhile, Toothy Jack is taking pot shots at the insulators of the telegraph line from the cab. Fireballs! I didn’t realize ammo blew up all at once like that. You learn something new every day. Behold vistas of Hollywood pyrotechnics at their finest. What’s left of the burning train finally rolls back into Tesota where the stationmaster and local fire brigade give it a good dousing. How does Outlaw Jack get away? Why, he simply poses as the engineer and fireman-carries Howard to the nearest hotel as his hostage. No one notices. Thus endeth the train scenes in Posse. I’ll save the surprise ending for film scholars more knowledgeable than I to interpret. The movie itself wasn’t that great, but the train bits were superb and I could watch those exploding boxcar scenes all day long. Besides that, Bruce Dern has one of the best snarling expressions I’ve ever seen. Check it out! This entry was posted in Uncategorized and tagged #11 The Reno, Baldwin Locomotive Works, Bruce Dern, Kirk Douglas, Old Tucson, Paramount Pictures, Posse 1975, Southern Pacific Railroad, Tesota Texas, V&T #11, Virginia & Truckee. Bookmark the permalink.